But with few procedural options to block Trump’s nominee, and uncertainty about whether they can even hold their caucus together, Democrats probably will have to settle for the next best option: using their fierce battle over a likely rightward shift on the high court to motivate voters in the 2018 congressional elections. 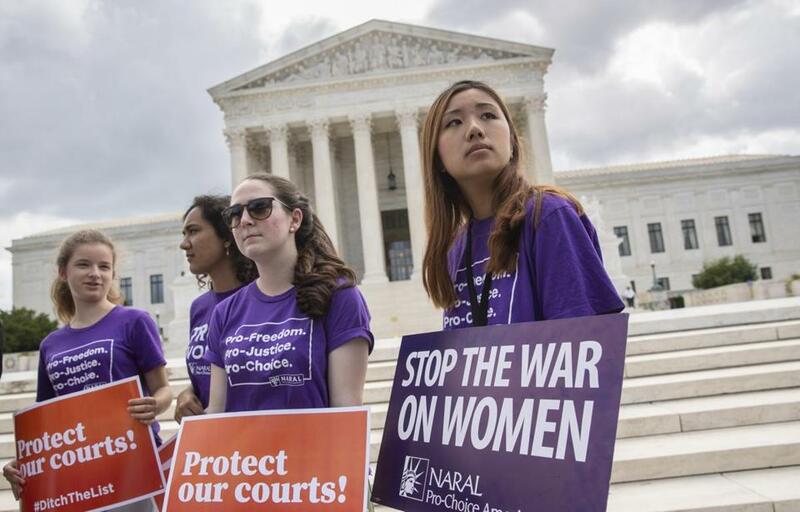 Women, especially female swing voters in suburbs, will be the targets of a relentless campaign focused on the likelihood of greater restrictions on abortion or even an outright reversal of Roe v. Wade, the 1973 Supreme Court decision that struck down abortion bans. Democrats are warning women could be “put in jail” under the reign of the future Supreme Court. Justice Anthony Kennedy, who is retiring, is a moderately conservative swing justice who was pivotal in decisions enshrining gay people’s right to marry and striking down states’ attempts to limit abortion rights. His replacement could take the court sharply right on the environment, gay rights, and abortion, among other issues. Democrats think the threat could galvanize their base even more than Democratic voters’ dislike of the president. 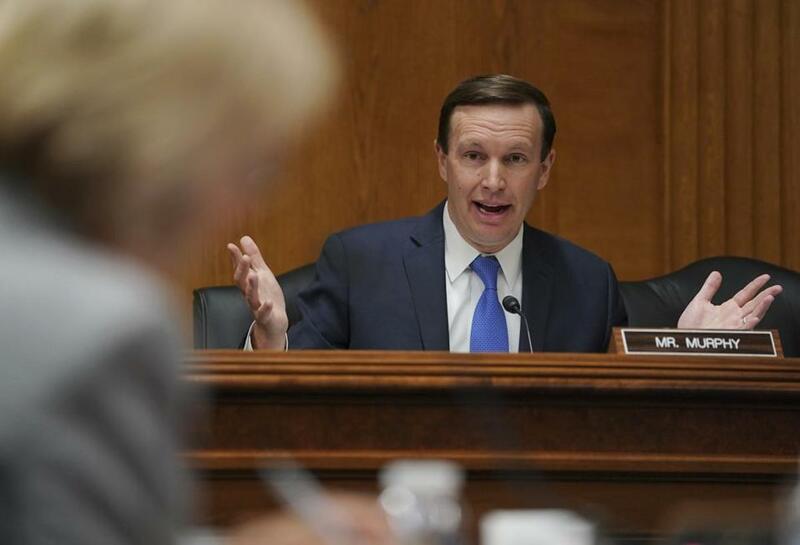 “I didn’t think that our enthusiasm could get bigger, but a tempest is coming,” said Senator Chris Murphy, a Democrat from Connecticut. Republicans are also giddy at the prospect of facing what looks like a tough midterm election with the boost of a second Supreme Court justice under their belts. But Democrats think this could be a miscalculation if they are able to make the Supreme Court battle a referendum on the right to a legal abortion a few months before the election. About 70 percent of Americans oppose overturning Roe v. Wade, according to several polls from Pew and Quinnipiac. Many suburban Republicans eager to talk tax cuts and the booming economy are unlikely to benefit from a conversation about banning abortion. While the Senate will be the focal point of the confirmation debate, Democrats have a better chance in the November elections of flipping the House from Republican control, and that is where the biggest impact could be. “Having a national debate about overturning Roe v. Wade imperils Republicans in the suburban districts that are key to their chance of holding the House,” said Jesse Ferguson, a former staffer for the Democratic Congressional Campaign Committee and Hillary Clinton’s presidential bid. MSNBC’s Rachel Maddow told Democrats on her show Wednesday night not to be “doormats” — urging them to unify as a caucus and use whatever tools necessary to block a pick. But Democrats have few procedural tricks available. They can refuse to show up for votes, but can be compelled to return to the Senate floor under the institution’s rules. They can slow hearings, but only for so long. “Ain’t gonna happen,” Senator John Cornyn of Texas, a Republican in Senate leadership, told reporters Thursday, referring to Democrats’ chances of blocking confirmation. Democrats are painting the confirmation battle in apocalyptic terms, calling the prospect of an antiabortion conservative replacing Kennedy “terrifying” and raising the specter of women languishing in jails. “So many of our fundamental rights, freedoms, and liberties — and the rule of law — are all at risk,” said former vice president Joe Biden. Maddow raised the prospect of the court allowing states to outlaw birth control, which was legalized in 1965. “What if birth control was illegal? What would you do if birth control was illegal?” she asked on her show Wednesday. Young activists demonstrated at the Supreme Court as President Trump prepared to choose a replacement for Justice Anthony Kennedy, on Capitol Hill in Washington on Thursday. All sides are planning expensive advertising and e-mail blitzes in an attempt to mobilize the grass roots. The focus on Roe could have a particularly strong impact on female voters, who have driven Democratic victories in special elections in Alabama and Virginia since Trump was elected in 2016. 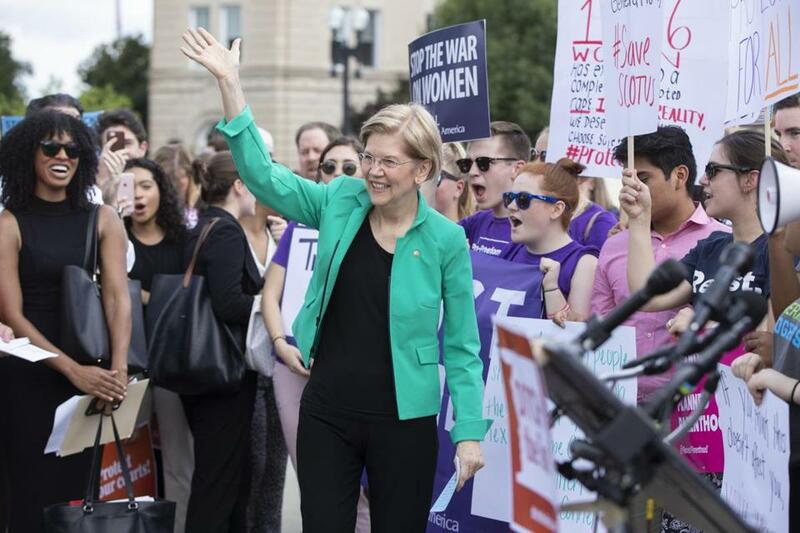 “Women around this country are already galvanized, they’re mobilizing politically in a way we haven’t seen in a generation,” said Senator Ed Markey of Massachusetts. Democrats hope to woo GOP Senators Susan Collins of Maine and Lisa Murkowski of Alaska, who are both in favor of abortion rights, to their side, robbing Trump of the majority he needs unless he picks someone who vows not to overturn Roe. But even if Collins and Murkowski were swayed by that argument, it’s unclear whether Democrats would hold together in opposition to a nominee who is evasive on the abortion question. A handful of Democratic senators up for reelection in red states are facing pressure to back the president’s pick no matter what. Senator Joe Manchin of West Virginia, a Democrat who faces a tough reelection bid this year, said Thursday that he would judge the pick based on his or her qualifications and dismissed the idea that Democrats could influence the pick or delay the confirmation. “We have very little control,” Manchin said.